The U.S. Fish and Wildlife Service on Tuesday announced that wolves in Southeast Alaska do not warrant an endangered species listing. The decision comes four years after a petition was filed by conservation groups asking for greater protection for the wolves. They are known as Alexander Archipelago wolves, a subspecies of the gray wolf, and range all over Southeast Alaska down to the British Columbia-Washington border. They den in the roots of large trees and prey on Sitka black-tailed deer. The population is estimated to be between 850 and 2,700 wolves, which according to the U.S. Fish and Wildlife Service, is healthy. Drew Crane is the Regional Endangered Species Coordinator. The agency’s review compiled data on the wolf and its habitat from the U.S. Forest Service, the Alaska Department of Fish and Game, the University of Alaska Fairbanks and British Columbia. It found that the population on Prince of Wales Island is declining, down 75 percent since the 1990s. Reasons for the decline include hunting, logging, and road development. . .which Crane says the federal government has noted. In other words, a decline on just one island in the wolf’s total range doesn’t warrant an endangered species listing. That’s Larry Edwards a Forest Campaigner with Greenpeace. He hasn’t yet read all of the 94 page decision but says that logging and development in the region over the decades has negatively affected the wolf’s habitat. An ESA listing could have meant greater restrictions on hunting or trapping wolves and may have impacted logging or other development. 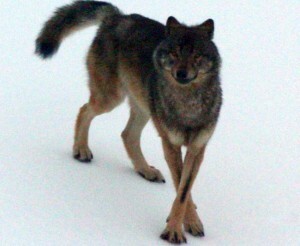 The management of the POW wolf population is the State’s responsibility. And the state of Alaska thinks the Feds made the right decision in not listing it. Bruce Dale is the Alaska Director of Wildlife Conservation. He’s says the overall population is in good shape. The state has been keeping track of POW’s wolf numbers since the late ’80s, early ’90s. Dale acknowledges that the population has declined substantially. The department’s own study last summer found 89 wolves were on Prince of Wales and nearby islands, down from 221 the year before. He says the state will continue to keep an eye on POW’s wolves and manage hunts accordingly. The decision NOT to list the Alexander Archipelago wolf as endangered is the final act coming from the federal government for now. Edwards says he doesn’t yet know what the conservation groups will do about the new decision.